On every Tet holiday, culinary artisan Mai Thi Tra often cooks vegetarian dishes to offer her ancestors. Soup, mixed salad, dried pho (rice noodles), kumquat ham, leaf cakes, chewy tapioca dumplings... are the dishes she often makes. The most eye-catching is a dish of colorful mixed salad made of orange carrots, purple cabbage, green cucumber, and black wood ear mushroom, decorated with red chili and tomato flower garnishes; all creates a brilliant look to the dish itself. In a more sophisticated recipe, Mrs. Tra pounds tofu, seasons it with spices, rolls the paste into the shape of kumquats, then steams and dyes them. These "kumquat fruits" dangling from their branches are truly an interesting way to decorate this vegetarian dish. 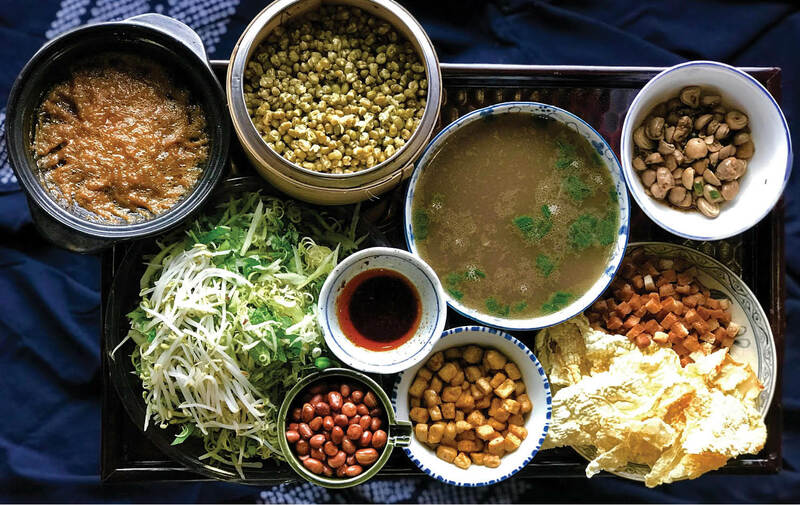 The subtlest of all is perhaps the mixed soup made from fresh mushrooms, green beans, lotus seeds, potatoes, carrots and phù chúc (a soybean product). The vegetables are carefully crafted; especially the potatoes are latex-freed before cooking. Lotus seeds are separately boiled and equally divided in the bowls. After seasoning, the finished product is a pleasant fragrance of beans, a nutty taste of lotus seeds and a sweet flavor of mushrooms. Among hundreds of her vegetarian recipes, this mixed soup made a deep impression on Western diners. In 2000, artisan Mai Thi Tra was invited by Mrs. 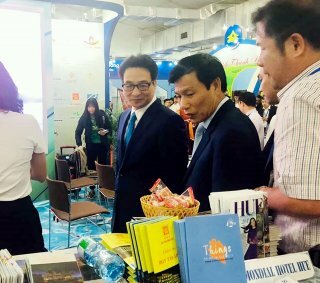 Ton Nu Thi Ninh to Hanoi to attend Hue Cultural Week. The soup was served at the welcome party for diplomatic corps and was highly praised. Later, Mrs. Ton Nu Thi Ninh went on to invite artisan Tra to Belgium to introduce vegetarian culinary delights. 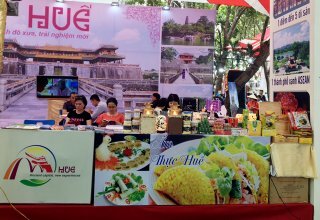 Mr. Christian Vanwert and Mrs. Thanh Phuong, a couple from Bruxelles supported artisan Mai Thi Tra to write the bilingual book "Hue style vegetarian" (Thuan Hoa Publishing House) in both French and Vietnamese. 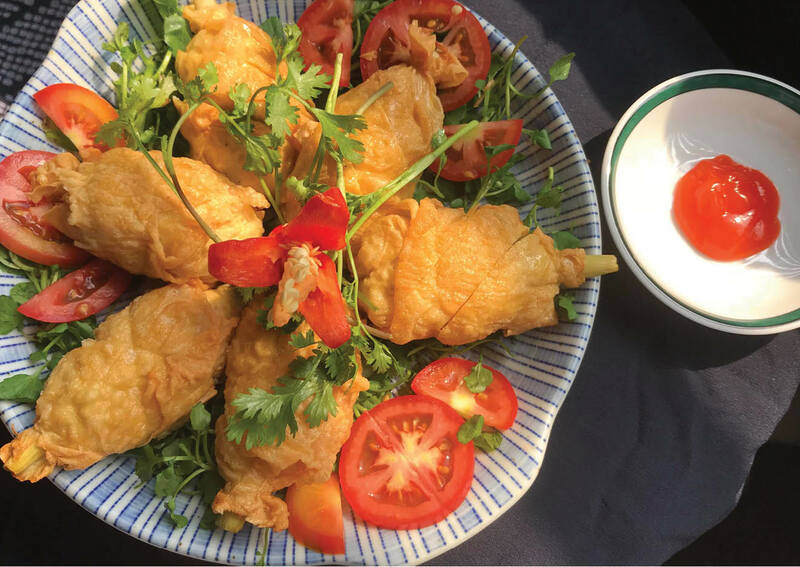 Artisan Mai Thi Tra often cooks vegetarian dishes in her own traditional way in which she uses little monosodium glutamate or harmful additives and replaces them with natural spices. 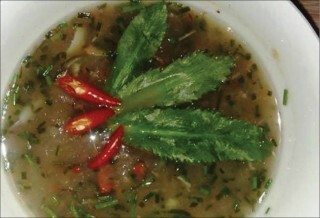 To increase the sweet taste for soup or porridge... she often uses a mixed vegetable broth with assorted fragrance and sweet flavor. As for each dish’s seasoning, she adjusts the taste with her creativity and experience but prioritizing the dish’s mild taste. 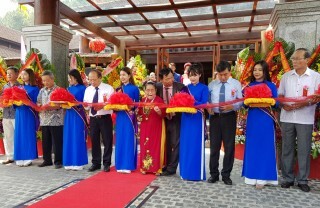 Artisan Mai Thi Tra was born to a noble family where her aunt, Mai Thi Vang, was King Duy Tan's wife, and her father was the district’s top mandarin. Ms. Tra, therefore, has mastered household arts since childhood. She can recall clearly every time her mother and the wives of other mandarins prepared feasts to offer King Bao Dai when he visited, in which vegetarian dishes were also included. “They finely grinded cooked green beans and cassava, shaped the paste into shrimp, fish, or pork rib to fry, simmer, or slow cook. 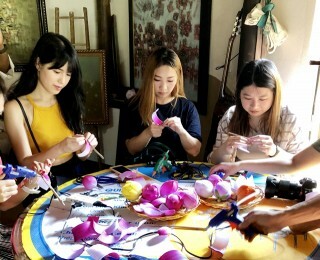 The ingredients from China were blended stylishly to enhance the marriage of color and taste; from steamed lotus and mushroom to vermicelli soup with needle and straw mushrooms, and vegan ham and huong mushroom stir fried with bamboo shoots...", Ms. Tra recalls. Artisan Mai Thi Tra said that sophisticated vegetarian dishes had spread out from the royal palace to the noble families, then the average households. 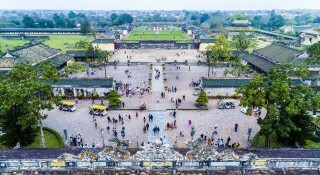 Every 3 years, the king held an offering ritual at Nam giao Esplanade for which he went vegan and slept on the ground at Trai cung (the Fasting palace) before the offering ritual. The Royal kitchen team on this occasion had to think of recipes for savory and elaborate dishes. They creatively mixed vegetables and fruits to make delicacies to offer to the king. In the early twentieth century, some of the royal concubines of King Thanh Thai and daughters of top mandarins became Buddhist nuns. 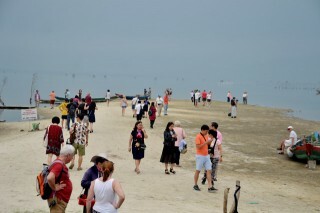 Their presence in pagodas had fostered the sophistication of vegetarian culinary, creating a diversity of dishes from stewed to grilled food, just like normal meat dishes. At that time, vegetarian food was still very limited with plain dishes like boiled vegetables, simmered jackfruit, mixed bamboo shoots, or pumpkin soup. 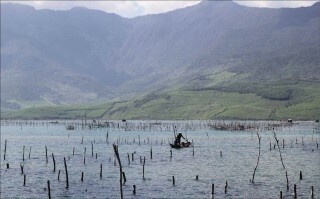 Pea and bean varieties were scarce; peanuts or sesame were not widely available, so people and pagodas had to use lai tree fruit to replace peanuts to create a greasy taste for soups. One of the most popular vegetarian dishes, nham was once regularly served both in and outside of the royal palace. The dish was a mixture of mung bean sprouts, banana flower, squeeze-dry chopped sour starfruit, and thinly sliced tofu. Instead of freshly mixing the ingredients like today's salad, nham had to be stir fried in a hot pan. This dish was a satisfactory blend of tastes and textures, from nutty and creamy feels to sour and acrid flavor, and was much loved by many people. These days, cooking ingredients were abundantly available, and so many past meager vegetarian dishes no longer exist. Ms. Tra still remembers the simmered paste made from pickled tram fruit to eat with vả (fig) in the winter days. Frugal yet enjoyable, indeed! Thanks to family education since early childhood, artisan Mai Thi Tra owns many secrets of cooking royal dishes, making jam and desserts. 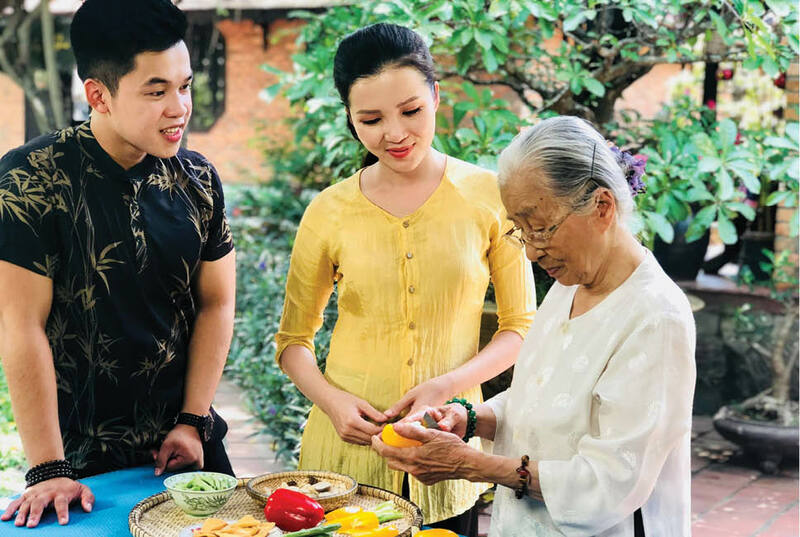 Ever since she became a strict vegetarian after the historic flood in Hue in 1999, she devoted herself to studying and teaching vegetarian cuisines. In order to cook delicious vegetarian food, besides knowledge and skills learned from the family, she also learns from the cooks in pagodas and accumulates more experience after decades helping them with the kitchen work. Now, even at the age of 85, artisan Mai Thi Tra still enthusiastically presents and teaches how to cook vegetarian dishes for kitchen lovers. 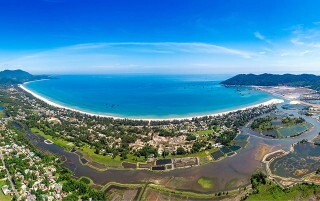 Resided in the Buddhist Capital, Hue locals, both noble and lower-classes alike, regard visiting pagodas and eating vegetarian food a remedy for peaceful souls, and this habit has become the city’s cultural beauty. On special and solemn occasions, Hue women still prepare grand vegetarian feasts for guests. Modest yet sophisticated, vegetarian food takes much time and effort for processing and cooking. In the book " An lạc mùa chay - Món chay dâng Mẹ” (Peaceful vegetarian season - Vegetarian for Mothers" (Women Publishing House, 2014), poet and food expert Ho Dac Thieu Anh wrote: "Normally, my family every year prepares at least a vegetarian meal to offer our ancestors at the beginning of the year. Additionally, four or five other offering feasts in death anniversaries must be present. 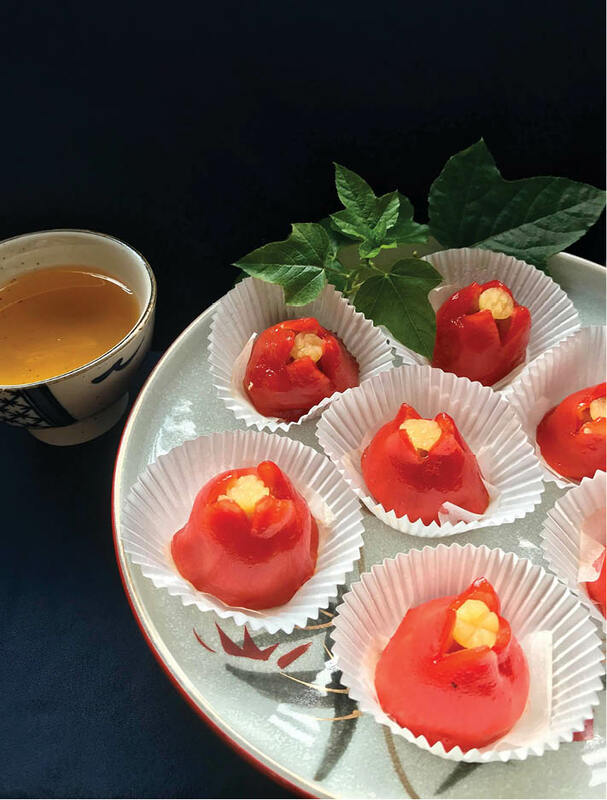 An offering vegetarian meal, often known as “cỗ lợt”, may include over 20 separate and delicate dishes… I would call every vegetarian dish a blossom that connects the cook and the divinities...”. Such cultural trait is still maintained to date.